Hey guys! Anyone else that loves collecting washi tape samples? Because I do, so I hosted this swap to give everyone the chance to receive different samples and exchange ones you have for them, rather than buying more. I put it as a type 3 so you are free to send it in any packaging you want, an envelope or box. You are required to send 15 samples of different washi tapes to your partners, a minimum of 18 inches each. A maximum of 3 plastic material washi tape samples are allowed, the rest needs to be paper material (No duct tape) and no repeats are allowed. Write a note with your name and the swap name for your partner, write a small letter for them too on a note card or paper. You may send these either in a package or an envelope, as long as it fits nicely. Make sure they are a fair size, not too many small sized ones. 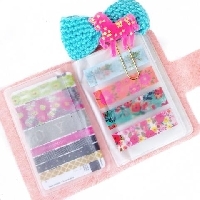 Make sure to also vary in the themes of the washi tape, not only one colour/theme. You have to have a minimum of 4.98 rating, with no recent unexplained 1s and 3s. (No newbie as this is a huge swap) Note: There has to be a minimum of 10 type 2 & 3 ratings. This is an INTERNATIONAL swap so expect to send and receive to/from all over the world. Flakers will be banned from all my future swaps. (I will not be angeling this swap due as it is a huge swap. Swappers have to have been logged in at least a day before the deadline. Your part of the swap has to be sent on time, if there is a reason for it to be late, do message your partner for permission / to inform them. This swap will be sender's choice but make sure it is something you would like to receive if it was you who was receiving. â™¥ I recommend you prepare the samples in advance before partners are assigned so it will be ready to be sent when assigned. Make sure they are of good quality. Stop saying this stuff, it is not even possible to have more than one account on one address!